No upfront cost fundraisers are hard to come by. So are free fundraising products in general. Enter the scratch off fundraiser. The scratch off – or scratchcard – fundraiser works like lottery tickets in reverse. Instead of your participants scratching the cards to see how much they’ve won, they scratch them to see how much they owe. You and your volunteers find potential donors and ask them if they’d like to play a game to support your cause. Most people will play when they find out that their obligation will be limited to $5.00 and might be even less. Call 1-866-216-2080 for your FREE sample scratchcard. Each scratch off fundraiser card has a bunch of dots and each dot has a dollar value behind it, from zero to $5.00, and whichever dot your participants’ choose to scratch off is the amount they agree (in advance) to pay. Be sure to mention the worthy cause your fundraiser is supporting. It’s a fun way to raise money without obligating anyone to spend a lot of money. Even better: for their trouble, your supporters will receive a bunch of valuable coupons just for playing. How is this idea free? These aren’t no cost fundraisers, but rather, fundraisers with no upfront cost. 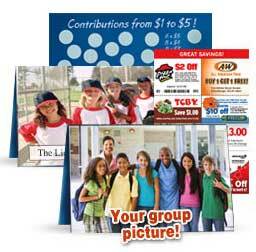 Fundraising.com will send you the fundraiser cards in advance (No money upfront = FREE). But if you’d rather pay upfront, you’ll get a 5% discount on the cards. Your group will raise up to $100 per card. Excellent. Scratch your way to earnings here. Or, follow the links below for more free fundraising ideas for non-profit organizations.